Your email software (or "client") allows you to create many folders in order to organise your messages. If you are running a business, you may need a folder for orders. You may even need a separate orders folder for each month. If you are a home user, you may have a folder for each specific friend or group of friends. Your email software also lets you create "rules" so that incoming messages are put into the relevant folder automatically. This saves cluttering up your "in" folder and removes the urgency to read every single message as it arrives. Most people "get connected" and immediately start to send and receive emails without any tuition at all. They pick up "bad habits" from others who learned to use email the same way - by copying others who also had no tuition. In English, it's normal to begin at the top of the page and read down until you reach the bottom. This works for books, newspapers, magazines and even Internet discussion forums. So why doesn't it work that way for emails? Well, historically, it always did. 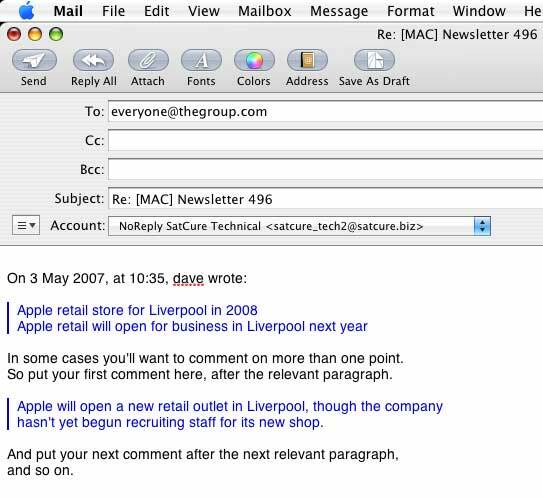 But most modern email software puts the cursor at the top of the page when you click on reply. Originally, this was intended to let people type the date, before scrolling down below any "quoted text" to type their reply. Unfortunately, many "newbies" decided that the flashing cursor was inviting them to type the whole message at the top, so that's what they did. Other newbies copied them and a whole generation of people grew up thinking that this was the way to type a reply. You read the answer. Then you scroll down to read the question. If you are sending your reply to a group of maybe hundreds of people, most of whom won't recall the question, it's not very friendly to "top post" like that. You force them to scroll down to read the question, then scroll back up to read your answer. And when many of the group are receiving messages in concatenated or "digest" form they will go crazy scrolling down and up, trying to make sense of it all. A. Yes OK, let's do that. Q. Should we go out on Wednesday for a good booze up? A. I think it may be a little short. Q. What do you think of the new dress I bought? And so on. It's not easy to follow! The correct way to reply to a message is as follows. (It may vary a little from one email "client" to another but most work this way.) First, you decide what specific sentence or paragraph you wish to quote in your reply and "highlight" it by dragging your mouse cursor diagonally from top to bottom. In this example, you can see the paragraph highlighted in blue. 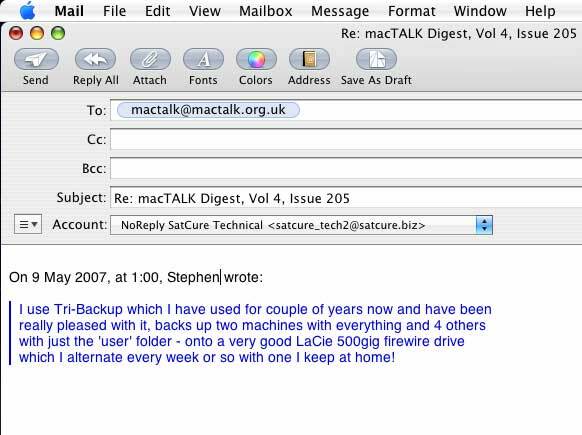 The highlighted text is transferred into a new message window. 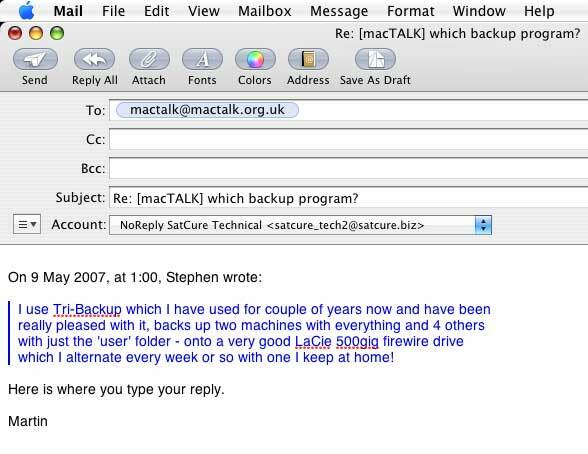 Some email "clients" will also put the date and the name of the sender above it, as in this example, above. 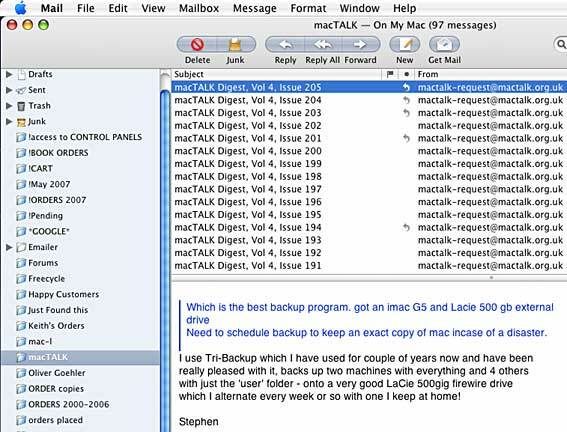 Some email clients (especially on-line ones like Yahoo and Hotmail) simply copy ALL of the text. In this case you should delete manually every paragraph that is not strictly relevant. Notice that the quoted text has turned blue and has a blue line running down the side. You can cause this to happen manually by highlighting the paragraph in your reply and pressing [cmd] [ ' ]. To reverse this, press [alt] [cmd] [ ' ]. Type your reply below the quoted text. 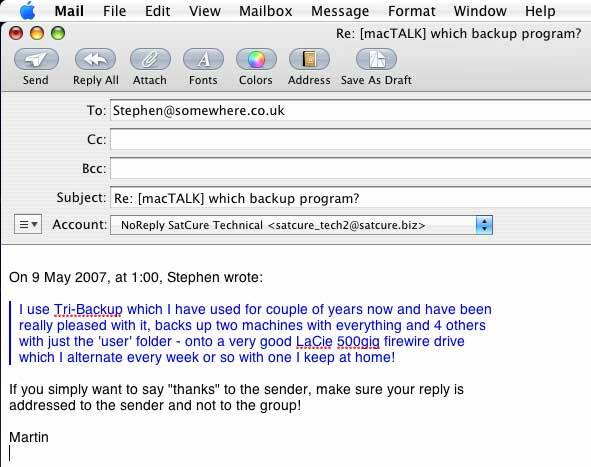 Check the "To" box to ensure that you are replying to an individual or to a group, as required. It is bad etiquette to send a personal thanks to the entire group if it refers to just one or two people. The example, above, is self-explicit. If you want to make several comments, you can split the quoted text and put each comment below the relevant quote. It's much easier to read and understand. (Most mailing lists have very specific guidelines about how you should format a reply so please observe the guidelines relevant to your message). Make sure that you quote the absolute minimum of text necessary for understanding what you are referring to. Also make sure that you do not quote any adverts or "how to unsubscribe from this list" instructions or other irrelevancies. When you send a message to more than one person, DO NOT put their email addresses in the "To" or "Cc" field unless everyone is already known to each other (e.g. in an office). If some of the group are unkown to other members, you must not expose their addresses without permission. This is considered rude and can lead to complaints. Instead, put your own email address (or a dummy address or an autoresponder address) in the "To" field and put the rest in the "Bcc" field. Apple Mail will allow you to use a group of email addresses from "Address Book". This group can be a "smart group". 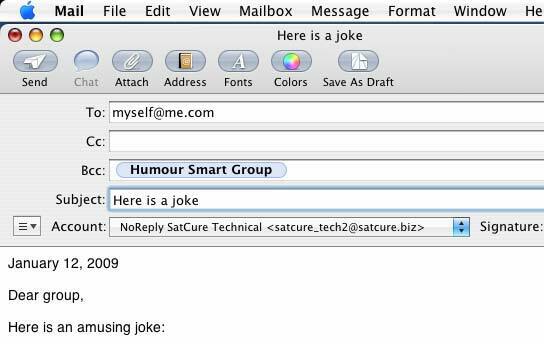 To create a "smart group", open "Address Book" and type (for example) "humour" in the "Notes" field of every intended recipient. Then create a "smart group" which selects all the people with "humour" in the record. Close Address Book and start to type "humour" in the "Bcc" field of a new Mail message. Your "Humour Smart Group" will be selected automatically. If you are communicating with friends who normally use "text speak" then it's perfectly acceptable for you do do likewise. If your friends don't use punctuation, capital letters or check their spelling, they will hardly object if you copy that. However, if you are communicating formally with a group of people or writing to a company, it is considered very poor form if your English is not easy to understand. Always have your spell checker ON and proof-read your message before you click "Send". Nobody expects perfection but you should do your best to communicate well. Try not to cause confusion by using the wrong word such as: "brought" instead of "bought"; "their" instead of "there"; "it's" instead of "its". If there's a reason why you can't communicate well - such as dyslexia or a stroke - you should state that with every reply. Most people will then make allowances. (You don't have to be specific. You can simply say "I have a disability which prevents me from seeing mistakes. Please excuse any poor English - I'm doing my best). If you are asking a technical question about (for example) a computer problem, it's important to list the make and model number of the computer and also any external hardware that might be relevant. (If you are not sure, list it all anyway). It's also important to state the size of your Hard Drive(s), the memory size and the computer Operating System version, as well as the version number of any software you are mentioning. You should then explain the nature of your problem, the history of your problem and any actions you have carried out to try to correct it (such as rebooting, disconnecting or changing peripheral devices, running a diagnostic or repair program and reinstalling software). If someone suggests something simple like rebooting and you didn't mention having tried it, in your question, you should not put them down with "of course I rebooted it - isn't it obvious?" Nothing is obvious unless you state it clearly. Nobody deserves to be put down in public. Always be polite. If you are tempted to make an impolite reply, sleep on it and type it in the morning. And do it privately - not to the group. Better still, don't reply at all if you have nothing good to say. Let it lie. Be careful with jokes and sarcasm. What is intended as gentle levity may be perceived to be a harsh insult. It's not easy to express real emotions in text. If you think someone has insulted you, be cautious with your reply and don't be accusing. You may simply have misunderstood. Emoticons (smiley faces) are often used to indicate emotion. Unfortunately, they mean different things to different people. ;-) a wink might mean they were joking or it could mean sarcasm. :-( unhappy is usually difficult to misinterpret.